myTEAM TRIUMPH (mTT) is an athletic ride-along program created for children, teens, adults and veterans with disabilities who would normally not be able to experience endurance events such as triathlons or road races. 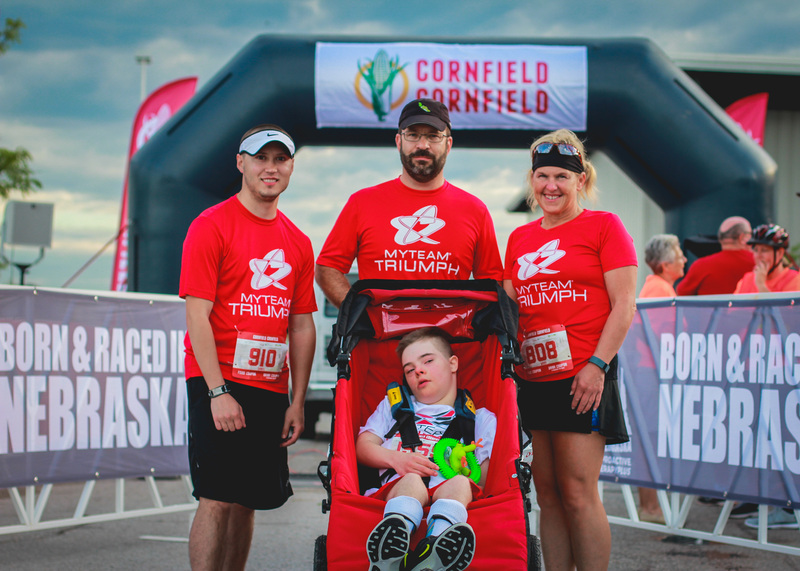 As a new non-profit in the Omaha area, mTT used the 2017 Cornfield Cornfield as their very first race. Steve Filips and Mitzi Klimek started the Omaha chapter after seeing the mTT Michigan chapter at a triathlon. “They were pulling people in boats, chairs, and bikes. They were doing a full triathlon! I ended up talking to them and found out there are chapters everywhere but there were none in Omaha,” Filips said. As for using the 2017 Cornfield Cornfield 10K as their first race, Filips said it was perfect. While there are a lot of logistics the team has to think about when it comes to choosing a race, Werner Park was a perfect location to get their team captain from the handicap access parking to his race chair and to the finish line. Filips took turns pushing Team Captain Payton Holling through the 6.2 mile course with their teammates Coleen Duda and Dan Ortiz. While this was their first race as a team, it wasn’t their first time running together. The four met many times to run around Zorinsky Lake to work out all the kinks and get use to working together. The team finished their first 10K together, but it definitely won’t be their last. Congratulations to their team and to Payton Holling for finishing his first ever race! To get involved with myTEAM TRIUMPH, you can reach the organization through their website or their Facebook page. You can also donate to their efforts for a new duathlon bike through their current Red Basket campaign.